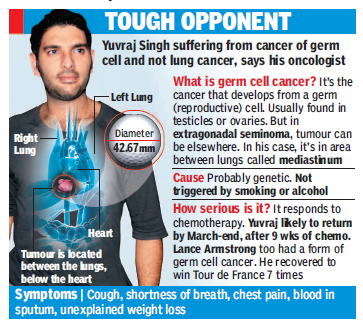 Yuvrai Singh is suffering from a very rare form of cancer, the extragonadal (mediastinal, in his case) Germ Cell Tumor (seminoma). Although less than 7% of germ cell tumors occur outside the gonads, the mediastinum is the most common location for the extragonadal seminoma. These tumors comprise about 10% of all malignant mediastinal lesions. They are seen almost exclusively in males in the second to fourth decade of their lives (1). Thankfully, the patients are symptomatic early on and hence can be diagnosed and treated in quick succession. Interestingly enough, men with Klinefelter’s Syndrome are known to develop these tumors earlier than the usual demography. Funnily enough, there seems to be evidence that this disease is amenable to spontaneous regression (4). Another tumor that has commonly been associated with spontaneous regression is Neuroblastoma, but more about that some other time. For now, back to Yuvi’s mystery illness that was purportedly misdiagnosed in India, causing a delay in the institution of appropriate therapy. 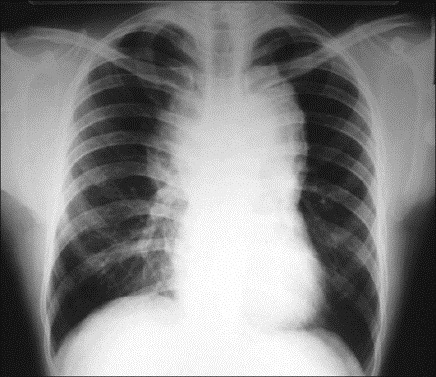 Plain chest X-ray showing enlarged mediastinum due to tumor mass (5). Now, coming to the two most important aspects of mediastinal germ cell tumors – treatment and prognosis. The consensus (6) for treating mediastinal germ cell tumors seems to be intense chemotherapy followed by surgical resection if needed. Surgical resection alone is not advocated due to high recurrence rates. Also, surgery without tissue diagnosis is discouraged owing to the possibility of a mediastinal lymphoma, which is more common in this age group and is amenable to cure using non-surgical means. It has been shown that primary chemotherapy is more effective in instituting progression free survival than radiotherapy alone and hence it is now the standard of treatment (7). Though the recommended regimen is three cycles of BEP (Bleomycin, Etoposide and Cisplatin) (8) there is poor evidence on the nature of the optimal therapy. The ideal way to find this out would be to conduct a randomized controlled trial but given how rare this disease is, it is unlikely that the numbers for such a research design can ever be drawn up. The prognosis for seminomatous tumors of the mediastinum is pretty good. Though the sample size numbers are fairly low in the post-multi-agent chemotherapy period, still, a 5 year survival is pegged at over 90% (9). As far as Yuvraj is concerned, an even better outcome is predicted by the fact that he is less than 37 years old. Other factors which may lead to a good outcome is absence of extrapulmonary metastases and early initiation of multi-agent chemotherapy (10). 1. Weidner N. Germ-cell tumors of the mediastinum. Semin Diagn Pathol. Feb 1999;16(1):42-50. 2. Fine G, Smith RW, Pachter MR. Primary extragenital choriocarcinoma in male subject: Case report and review of the literature. Am J Med. 1962;32:776–94. 3. Friedman NB. The function of primordial germ cell in extragonadal tissues. Int J Androl 10: 43-49, 1987. 4. Hachiya T, Koizumi T, Hayasaka M, Kubo K, Sekiguchi M, Hanyuuda M, Honda T. Spontaneous regression of primary mediastinal germ cell tumor. Jpn J Clin Oncol. 1998 Apr;28(4):281-3. PubMed PMID: 9657016. 6. Takeda S, Miyoshi S, Ohta M, Minami M, Masaoka A, Matsuda H. Primary germ cell tumors in the mediastinum: A 50-year experience at a single Japanese institution. Cancer. 2003;97:367–76. 8. Schmoll HJ. Extragonadal germ cell tumors. Ann Oncol 13: 265-272, 2002. 9. Bokemeyer C, Nichols CR, Droz JP, Schmoll HJ, Horwich A, Gerl A, et al. Extragonadal germ cell tumors of the mediastinum and retroperitoneum: Results from an international analysis. J Clin Oncol. 2002;20:1864–73. 10. International Germ Cell Cancer Collaborative Group. International Germ Cell Consensus Classification: a prognostic factor-based staging system for metastatic germ cell cancers. J Clin Oncol 15: 594-603, 1997. Tags: Cancer, Cricket, Days in Medicine, Medicine, postaday, World Cancer Day, Yuvraj Singh. Bookmark the permalink. Thanks for your post… I missed that date too.